AAP leader Sanjay Singh has said the property owned by Nirav Modi & other fugitives in the country should be auctioned by the government to return people's money. 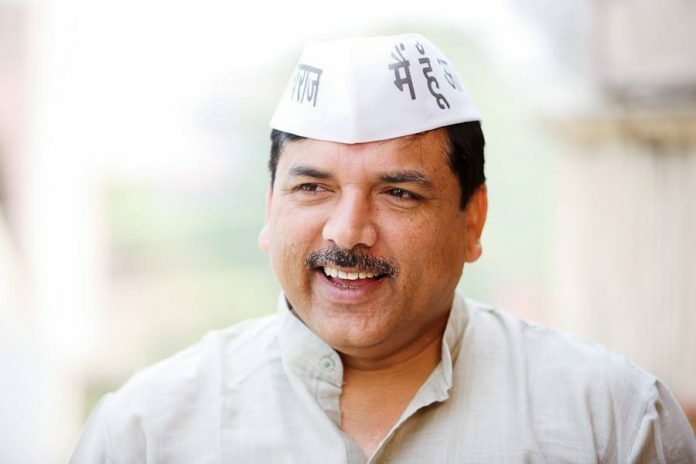 New Delhi: AAP leader Sanjay Singh said on Wednesday there was no point in arresting fugitives like Nirav Modi until taxpayers’ money looted by them is returned to the country. Nirav Modi, the main accused in the USD 2 billion Punjab National Bank scam case, was arrested in London where a court on Wednesday remanded the fugitive diamantaire in custody till 29 March, saying there were substantial grounds to believe that he would fail to surrender if granted bail. Reacting to the development, Singh said fugitive Vijay Mallya was also arrested recently, but the matter died down. He said till the taxpayers’ money looted by fugitives like Nirav Modi was returned to the country, there was no point in such arrests. “The fugitive economic bill has been passed by the Parliament, so the property owned by these people in the country should be auctioned by the government to return people’s money — that is our demand. The government should be worried about how the loot by these people should be returned to the country,” the AAP leader said. Nirav Modi’s arrest came days after a London court issued an arrest warrant against him in response to a request by the Enforcement Directorate for his extradition in a money laundering case. Thumps Down. AAP must know that something has been achieved. You started your party to fight against corruption and you joined hands with those against your Basic principles. One can see the classic example that how Money and Power can corrupt in modern time. Arrest is part of a legal process to bring Nirav Modi back to India, to face the law. Welcome development. 2. When one scamster flees with an unpaid bill of 13,000 crores it does not hurt us the way it should, for no one is making a proportionate debit to our funds lying in the bank. There was a proposed amendment to the law – fortunately dropped – that would have allowed banks to freeze part of depositors’ funds and convert them into ( worthless ) equity. Recap funds are being burnt through by banks to defray losses, without enhancing their capacity to lend to productive sectors. MUDRA loans have started turning sour. Mr Chidambaram hinted once that there is no sovereign guarantee for funds lying in deposit with PSBs. Politicians being what they are, expect drastic surgery only when it is no longer possible to kick the can further down the road. How is it that one gets the distinct feeling that the AAP, founded supposedly on the cry for a corruption-free India, would have much preferred that Nirav Modi had not been arrested? The AAP seems to be worreid that Nirav Modi might be extradited soon to India. That court testimony by Nirav Modi might help identify bad actors in PNB. That Nirav might have to face the consequences of his criminal actions. That the entire saga will help move India toward a less corrupt society and a more law-abiding society. Why does AAP prefer to protect the corrupt and rejoice when the corrupt are caught? Why?